The demand for skilled educational administrators and researchers continues to rise in the U.S. If you have a passion for keeping up with shifting demographics and meeting student and faculty needs, an online doctorate in higher education might be the right choice for you. This advanced degree builds leadership skills in a variety of roles such as student services, enrollment management, education administration, and academic support. Many higher education programs also prepare you for advanced academic research, which explores new strategies to meet changing educational needs. An online Ph.D. in higher education is the highest degree attainable in the field. This level of specialization can also lead to increased job opportunities. For example, the Bureau of Labor Statistics (BLS) projects that careers for postsecondary education administrators will grow 10% through 2026, a rate faster than the national average. What Else Can I Expect from an Online Doctorate in Higher Education Program? University of Florida Distance Learning ranks among The Best Online Doctorate in Higher Education Degree Programs! Based in Gainesville, UF is a senior member of the state university system, serving around 55,000 students annually. The college's online doctorate in higher education is a blended program that prepares graduates to serve in leadership roles at higher education institutions or nonprofits focused on postsecondary education. Offered in a cohort format, the program takes place primarily online, with three weekend campus sessions held each semester. These required campus sessions take place on the UF campus and at other schools around the state, making it convenient for working students to attend. Typically comprising 2-3 courses each semester, the degree can be completed within four years of part-time study. Students explore a broad selection of administration topics, with unique courses like student affairs administration, community colleges in America, and educational statistics. UF is regionally accredited from the Southern Association of Colleges and Schools Commission on Colleges (SACS). University of Nebraska Lincoln ranks among The Best Online Doctorate in Higher Education Degree Programs! A public college located in Nebraska, UNL is a major educational hub in the Midwest, serving more than 25,000 students each year. The school offers two options for students pursuing a doctorate in higher education online: an Ed.D. or a Ph.D. in educational studies with a specialization in higher education. While both programs offer a comprehensive overview of higher education practices, they serve different ends. The Ed.D. is a professionally focused degree that prepares graduates to serve in leadership positions within colleges and universities, while the Ph.D. is an academically focused degree that prepares graduates for scholarly research into higher education practices. Accordingly, the Ed.D. emphasizes more practical administrative skills, while the Ph.D. emphasizes more theoretical skills rooted in scholarly inquiry. The Ed.D. is available fully online, while the Ph.D. requires six credits of research coursework to be completed on campus. University of Nebraska–Lincoln is regionally accredited from the Higher Learning Commission (HLC). Colorado State University - Fort Collins ranks among The Best Online Doctorate in Higher Education Degree Programs! The flagship institution of Colorado's state university system, CSU's main campus in Fort Collins serves around 33,000 students annually through both classroom and online programs. The school's Ph.D. in higher education online builds advanced skills for leadership in academic institutions, preparing students for positions in enrollment management, student services, administration, academic support, and housing services. Using a convenient, fully online format, this program caters to working professionals, allowing students to pursue their doctorate while maintaining full-time employment. Degree candidates complete the curriculum in a cohort format, proceeding through most courses in a cohesive peer group. The cohort model encourages mutual support and creates a deeper network of professional colleagues for students to draw on after graduation. The degree requires a total of 60 credits and typically takes five years. CSU is regionally accredited from the Higher Learning Commission (HLC). Nova Southeastern University ranks among The Best Online Doctorate in Higher Education Degree Programs! Based in Davie, Florida, NSU is a private college that enrolls around 24,000 students annually. The school's doctor of education with a concentration in higher education leadership examines the political, social, and economic factors affecting higher education organizations, developing leadership skills for both current and aspiring educators. Combining educational theory and practice, the curriculum builds knowledge in key areas, including research, social intelligence, systems thinking, problem-solving, and professional development. The 54-credit doctorate in higher education online curriculum typically takes students three years to complete, with required components including concentration courses, research courses, applied dissertation benchmarks, and electives or minor courses. Degree candidates choose either a qualitative or quantitative research track based on the direction of their dissertation. Most course material is available fully online, but all students must attend a summer residency that includes significant dissertation work. NSU is regionally accredited from the Southern Association of Colleges and Schools Commission on Colleges (SACS). University of Memphis - UM Online ranks among The Best Online Doctorate in Higher Education Degree Programs! Enrolling more than 21,000 students annually, U of M is home to a sizable online learning program that includes an Ed.D. in higher and adult education with a concentration in higher education. This professionally focused degree prepares students for mid- and senior-level leadership positions within colleges, universities, and education agencies. U of M emphasizes diverse approaches to education, and unlike many online doctoral programs in higher education, welcomes students from a variety of backgrounds outside of education, such as health, business, and law. The program requires a minimum of 54 credits, with four core classes included in the higher education concentration: higher education administration, legal/ethical issues in higher education, higher education finance, and issues/trends in teaching adults. Candidates also complete six approved elective hours that allow them to explore any area related to their higher education practice. U of M is regionally accredited from the Southern Association of Colleges and Schools Commission on Colleges (SACS). Maryville University of Saint Louis ranks among The Best Online Doctorate in Higher Education Degree Programs! Based in the St. Louis suburb of Town and Country, Maryville offers an online doctorate in higher education that examines leadership from social, business, and political perspectives. Combining theory, practice, and the development of personalized leadership philosophies, the program uses a project-based cohort format that allows a group of 15-22 students to move through the course sequence at the same pace. Near the beginning of the degree, candidates begin a professional capstone project that lasts the duration of the program. Additionally, degree candidates complete a long-term internship that runs throughout the course of the program, which builds a varied body of professional experience. Maryville maintains partnerships with many organizations throughout the St. Louis area, providing unique opportunities for internships in a variety of work environments, such as the Parkway School District or the St. Louis Cardinals. Marysville is regionally accredited from the Higher Learning Commission (HLC). Andrews University ranks among The Best Online Doctorate in Higher Education Degree Programs! A Seventh-Day Adventist college based in Berrien Springs, Michigan, Andrews offers three online doctoral programs in higher education administration: a doctor of philosophy, a doctor of education, and an education specialist degree. Preparing graduates for positions in teaching, research, corporate training, and policy-making, these programs feature a uniquely international focus. Students typically visit colleges around the world, gaining a cross-cultural perspective on education administration. Admission to any of the three programs requires a master's degree or equivalent from an accredited college. The degrees typically require 4-5 years, though candidates have up to seven years to complete all coursework. Students choose from five start dates throughout the year (including three summer sessions), making it convenient for working professionals to fit a degree into their schedule. Andrews is regionally accredited from the Higher Learning Commision (HLC). Regent University ranks among The Best Online Doctorate in Higher Education Degree Programs! An interdenominational Christian college based in Virginia Beach, Virginia, Regent offers a doctor of education in higher education that prepares graduates for careers as post-secondary administrators. Designed for current educators or administrators looking to advance their careers, this primarily online doctorate in higher education emphasizes key knowledge areas, including program evaluation, finance, law and governance, and organizational theory. The 66-credit degree curriculum includes unique courses, such as Christian worldview for educators, data-driven decision making, and higher education finance. The school offers its coursework primarily online, but all candidates must attend two week-long residency sessions held on the Regent campus. Worth two credits each, these residencies give students the opportunity to collaborate with peers and faculty members for workshops, networking events, social gatherings, and dissertation work. Regent is regionally accredited from the Southern Association of Colleges and Schools Commission on Colleges (SACS). Notre Dame of Maryland University ranks among The Best Online Doctorate in Higher Education Degree Programs! A private Catholic college in Baltimore, NDMU offers a Ph.D. in higher education leadership for changing populations, a unique program that addresses demographic shifts in both higher education and the U.S. at large. Emphasizing both policy and practice, this fully online Ph.D. in higher education requires a total of 51 credits divided between four major areas: the changing populations core, the higher education core, the research core, and the dissertation. Some of the program's unique courses include digital game-based learning, changing populations in a historical perspective, and curriculum development for changing populations. Along with the program core and the dissertation, degree candidates must also complete comprehensive oral and written examinations that assess both procedural and conceptual knowledge. Some exam components also focus on the specialized area in which candidates choose to perform their dissertation research. NDMU is regionally accredited from the Middle States Commission on Higher Education (MSCHE). Saint Peter's University ranks among The Best Online Doctorate in Higher Education Degree Programs! Jersey City, New Jersey is home to Saint Peter's, a small Christian college that is home to around 3,500 students. The school's online Ed.D. in educational leadership with a concentration in higher education is intended for mid-career education professionals looking to move into high-level leadership roles. Based around a program of thought leadership, the degree explores the strategic and operational issues that affect contemporary institutions, including enrollment management, state and federal policy, student life, accountability and assessment, and financial models. The online doctorate in higher education blends experiential learning and research, offering both broad perspectives on education administration and a specialized focus through the dissertation. The 48-credit curriculum covers major topics, such as historical trends in higher education, enrollment management and marketing, ethical foundations and social responsibility, and student development and programming. Saint Peter's is regionally accredited from the Middle States Commission on Higher Education (MSCHE). Wilmington University ranks among The Best Online Doctorate in Higher Education Degree Programs! A private college in New Castle, Delaware, Wilmington is home to a respected distance program that includes an online doctorate in higher education. The school's Ed.D. in higher education leadership and innovation prepares graduates to develop effective strategies for higher education supervision and leadership. The 54-credit curriculum includes the program core, a fieldwork component, and a capstone project. The program core requires a total of 36 credits and features unique courses, such as supervisory behavior, pluralistic communities and administrative issues, and the art of leadership. The nine-credit field component requires 120 hours of clinical field experience in a higher education setting, giving candidates the opportunity to apply their class learning to professional practice. Finally, the nine-credit capstone functions as an applied research project into a higher education area of the student's choice, serving as a culminating activity for the program. Wilmington is regionally accredited from the Middle States Commission on Higher Education (MSCHE). Indiana State University ranks among The Best Online Doctorate in Higher Education Degree Programs! Based in Terre Haute, ISU is a major public college that serves over 12,000 students annually. The school's Ph.D. in educational administration with a specialization in leadership in higher education prepares students for leadership positions in two- and four-year colleges, technical schools, and other postsecondary institutions. This partially online doctorate in higher education includes classroom learning, independent study, and a significant practicum component that allows students to gain hands-on experience in a higher education setting. Operating in a cohort format, the program requires students to take three courses (nine credits) each semester, completing the curriculum within two years of full-time study. ISU's program uses a blended format that mixes online meetings with weekend workshop and seminar sessions held on campus. The program also requires candidates to attend a three-week summer residency on campus. ISU is regionally accredited from the Higher Learning Commission (HLC). Coursework can vary significantly between online doctoral programs in higher education, with some focused on practical skills for educational administration and others on academic skills for research. In general, however, this degree offers a comprehensive perspective on the major practices in higher education and the strategies used for gauging their effectiveness. Foundations of education research: Part of most programs, this course introduces the major principles of education research, exploring the theoretical, practical, philosophical, and ethical dimensions of performing research. Given its broad nature, this course pertains to all types of higher education careers. Higher education law: Exploring the application of legal theories and practices to higher education, this course is mandatory for candidates in administrative positions. Higher education law typically covers topics that include nondiscrimination in employment, privacy and openness, contractual obligations, tenure, academic freedom, and program discontinuance. Adult learners: Designed to address changing age demographics in higher education populations, this course focuses on the major theories and perspectives associated with adult learning. A common requirement for higher education administrators, the course also presents strategies for meeting the unique needs of these students. Enrollment management and marketing: Addressing issues of strategic enrollment, this course aids candidates in college enrollment departments. Students explore fundamental topics such as branding, forecasting, differentiation, and alumni relations. Increasingly, enrollment and marketing management also involve social media and other digital public relations tools. Higher education practicum: Regardless of focus or career goals, most candidates earning their Ph.D. in higher education online must complete a professional practicum, typically at their place of employment or another professional higher education setting. The practicum offers the chance for hands-on learning, allowing students to draw connections between coursework and their own professional practice. How Long Does It Take to Get an Online Doctorate in Higher Education? 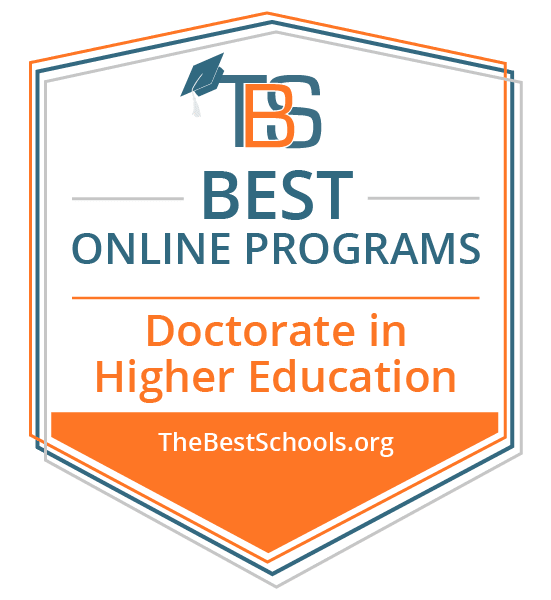 Earning a doctorate in higher education online requires commitment, and one factor in your choice of program may be its total completion time. In general, most programs require 50-60 credit hours, taking anywhere from 3-5 years to complete, but this can vary based on factors such as residency components. Most Ph.D. higher education online programs also require you to possess a master's degree in a related field. Some doctoral degrees use an accelerated format that features a more intensive course schedule but allows you to complete your education faster. These programs often include residency sessions that require you to spend a certain amount of time on campus for concentrated classroom learning. Some degrees may also use an independent, self-paced format that allows you to complete work on your own schedule, while others use a cohort format where you complete a set sequence of courses with the same group of students. When researching online programs, determine the school's accreditation status, which indicates academic reputability and quality. Accreditation indicates that a school received a positive assessment of their academic programs from a licensed accreditation agency, designating the institution's ability to adequately serve students. Colleges and universities in the U.S. receive either regional or national accreditation. Typically, professional and vocational programs hold national recognition, while academic programs receive regional accreditation. Any reputable online doctorate in higher education will hold regional accreditation. When examining doctoral programs, look for an accreditation status from agencies like the National Council for the Accreditation of Teacher Education (NCATE), the University Council for Educational Administration (UCEA), or the Higher Learning Commission (HLC). While the U.S. Department of Education (ED) oversees both primary and secondary education in the U.S., it does not provide accreditation to postsecondary institutions, such as colleges and universities. Instead, the Council for Higher Education Accreditation (CHEA) oversees these institutions, counting over 3,000 schools and around 60 accreditation organizations among its members. The ED also conducts reviews of all accrediting agencies, ensuring that they meet certain government standards. Together, these two organizations maintain standards for higher education in the U.S. CHEA aims to eliminate degree mills -- fraudulent education providers that offer counterfeit academic programs for profit. Both CHEA and the ED maintain listings of accredited schools and accrediting organizations, which can be useful when determining the reputability of a school or online program. While many career paths exist for those with a doctorate level education, most graduates choose to pursue a career in administration or academics. In administration, common positions include enrollment management, student services, and -- at the highest level -- academic dean or provost. The academic path emphasizes teaching and research almost exclusively. However, academics occasionally move into higher-level administrative positions later on in their careers. Regardless of specialization, most careers in higher education require strong communication, organization, and problem-solving skills. Postsecondary Education Administrator: Education administrators coordinate college operations and ensure that students, faculty, and staff receive adequate support. They may oversee various facets of college operation, such as student life, registration, admissions, or alumni relations. Administrators may also coordinate everything from annual budgets to academic programs. Postsecondary Teacher: College and university professors instruct students beyond the high school level while simultaneously performing advanced research and publishing their findings. Higher education specialists focus their research on improving education practices. Academics may also participate in administrative functions, particularly in their area of expertise. Instructional Coordinator: Instructional coordinators supervise, assess, and develop curricula and practices. They typically work alongside colleges and universities to examine the effectiveness of instruction and offer ideas for improvement. Coordinators may also work with state or national education agencies to determine large-scale strategies. School and Career Counselor: These specialists work with students to develop the skills needed for social and academic success in both school and life. Counselors may connect students to additional campus resources, such as mental health services. Career counselors, however, may connect students to job opportunities and internships. Several factors can influence salary prospects for postsecondary education administrators, including education level, professional experience, place of employment, and location. Most of the top-paying states for education administrators are found in the eastern U.S., including New Jersey, Delaware, and Maryland. California and Hawaii also boast higher salaries for education administrators. The following chart from the BLS compiles salary information for administrators. Higher education administrators in these states can expect to earn annual mean salaries well over $100,000, demonstrating the advantages of earning an advanced degree. Given the constantly changing nature of higher education, professionals in the field depend on trade organizations to share knowledge and improve their practices. Professional higher education groups offer their members an assortment of benefits, including conferences, academic journals, professional development opportunities, job connections, and a host of other networking opportunities. Many of these groups also offer opportunities for students that includes mentorships, research opportunities, and internships. American Association of College Registrars and Admissions Officers (AACRAO): This unique organization, intended specifically for those in registration and admissions, works to ensure ethical standards for student services and enrollment management. AACRAO counts more than 11,000 members from 2,600 schools around the country. American Association of University Administrators (AAUA): Founded in 1970, AAUA encourages professional development and ethical standards among higher education administrators. The group hosts a variety of professional conferences and publishes the Journal of Higher Education Management. American Association of Colleges and Universities (AAC&U): AAC&U seeks to promote liberal education at the undergraduate level. The organization offers substantial educational and institutional resources, member advocacy, professional publications, and collaboration opportunities. Depending on your income, professional background, and your program, you may have several options for funding your online Ph.D. in higher education. Education students can often take advantage of special opportunities unavailable to those in other fields, including tuition reimbursement specifically for educators. Depending on where you work (particularly if you're already employed in higher education administration), your employer may pay for some or all of your degree for the purposes of professional development. Plenty of options exist to help supplement the full cost of your tuition. Prospective students should begin by filling out a Free Application for Federal Student Aid (FAFSA), as it offers you access to grants, scholarships, low-interest loans, and other funding measures. Completing the FAFSA may unlock grant opportunities that require you to do nothing other than claim your funding. Even without grants, educators have access to a wide variety of scholarships that can help with tuition.